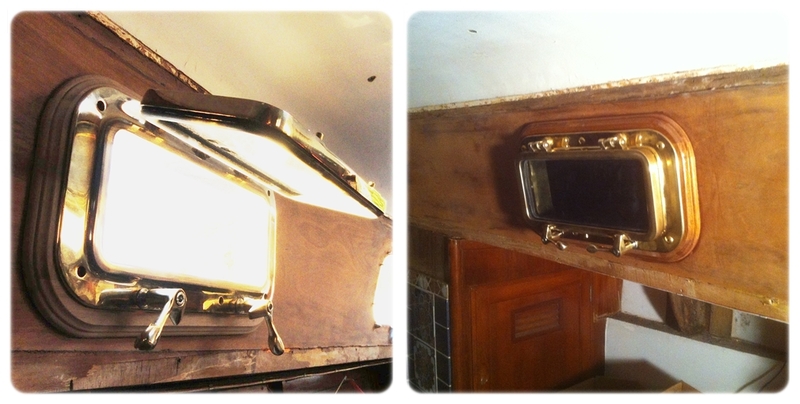 We replaced the 6 fixed windows with new bronze opening portlights from New Found Metals. We scoured for used portlights, but finding a matching 6 in the right size was not looking hopeful. We stumbled upon New Found Metals online to find their new portlights were actually cheaper than any used ones we seen. People want a lot for old chalky portlights with broken glass. Maybe value is added for being antique. The customer service at New Found Metals was excellent, from helping you order the right kit, to answering installation questions. The man in the online instruction video is the designer, manufacturer, and the person you talk to on the phone if you have any questions. He and his small staff were very helpful. The old windows were the same as the large windows we replaced in the last post, glass set in flush with the cabin and held on with glue and tiny screws. Half of the glass was covered in seams of caulk proceeding in rows, and the rest was a cloud from the delaminating glass. Naturally, they all leaked pretty badly. To begin installation, clamp drilling template in place, drill holes, and trace the outline of the new window. The 3/8" holes drilled through the template were re-cut with a high speed 5/8" piloted cutting tool that came with the installation kit. It leaves a much finer result than a drill, slicing off thin smooth curls as it spins. Next, cut out the window. 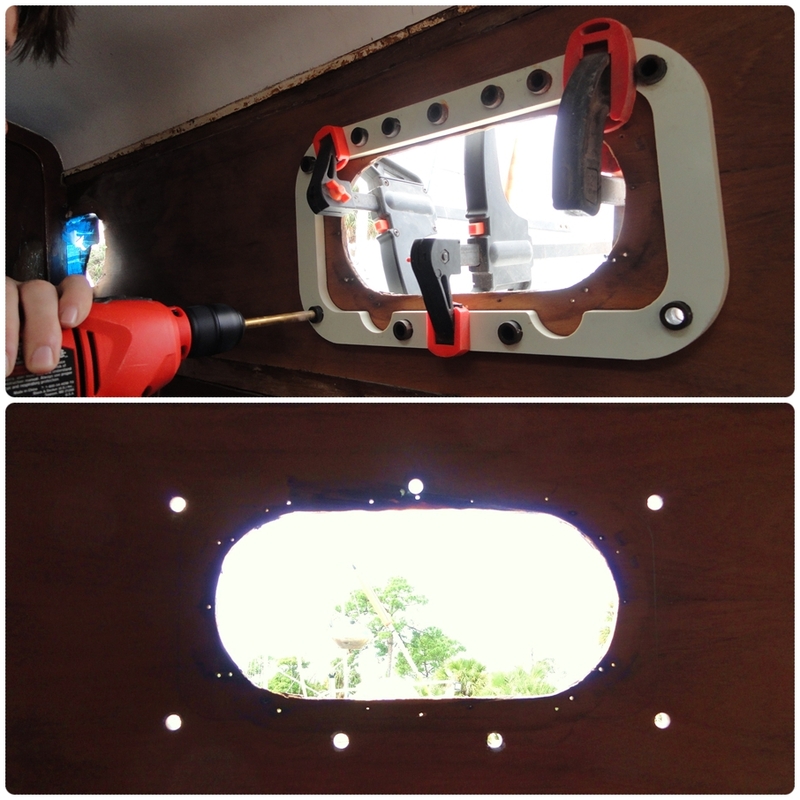 AJ drilled small holes to cut out the curves, then used a multi-tool to cut the straight edges. Sand and file till smooth and even. The portlights have a 1 1/2" spigot around them. Our cabin sides are only 3/8" thick to start with, so we had to use teak spacers (also provided by Newfound Metals) to bring the cabin up to the 1" minimum thickness for installation. Glue on the teak trim ring. Sand and file the rough edges until beautiful and flush with the teak trim spacer. 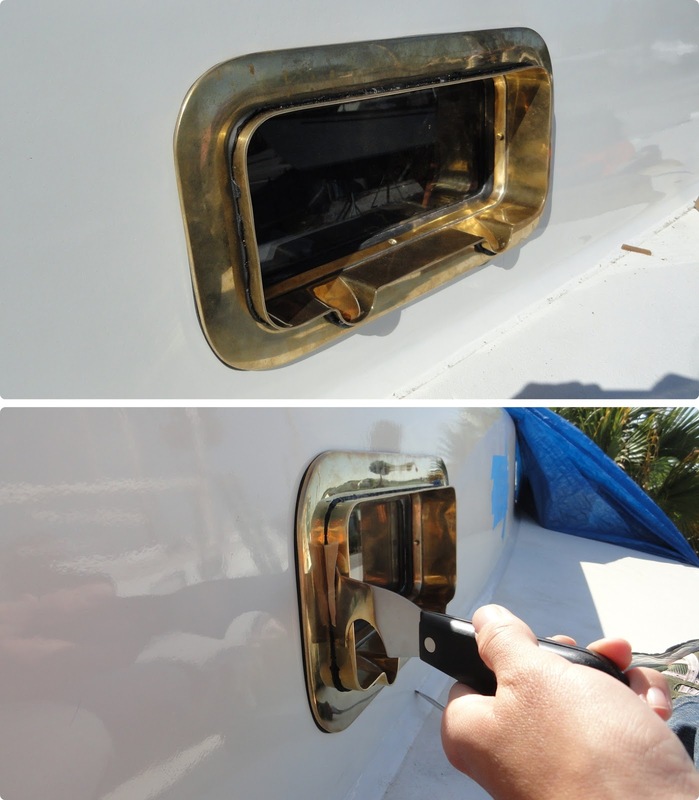 Smash strips of sticky, pliable butyl rubber to the portlight. (About half as much as shown below.) Apply neoprene weather seal tape on the outside perimeter of the outer trim ring. Apply thinner ring of butyl to inside perimeter of the trim ring. Clamp window on however you can... to compress the butyl and set the portlight. Fill any gap between the cut out and spigot with butyl rubber. Leave it standing a bit proud around the seam. Place the trim ring and squeeze it on tight. The clamp down the trim ring to compress. Screw the portlight to the frame from the inside. 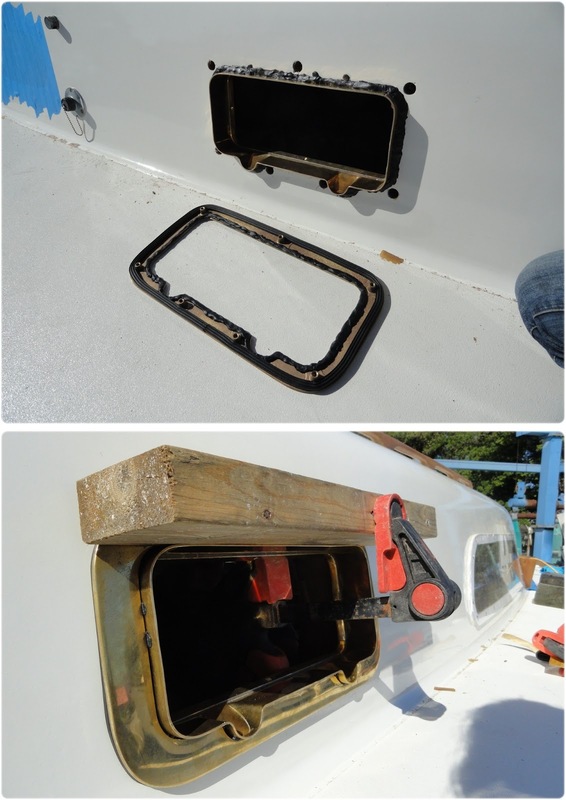 The screws that came with the portlights accounted for maximum cabin thickness and our cabin is only 3/8" so they had to be cut to length. Pull off excess butyl or cram in more to fill gaps. Don't bother cleaning up the butyl edge for a day or so. It continues to ooze out very slowly for a minimum of a few hours. I liked working with butyl rubber after all the noxious runny caulks and epoxies. It's like a sticky, tough play-do. Just stretch it to the desired thickness, squish it around, peel off excess, mash into a ball and re-use. It doesn't leave much residue on your fingers either, though I don't know if it ever comes out form under fingernails. To finish, remove the screws one at a time and bed them in silicon. Voila! 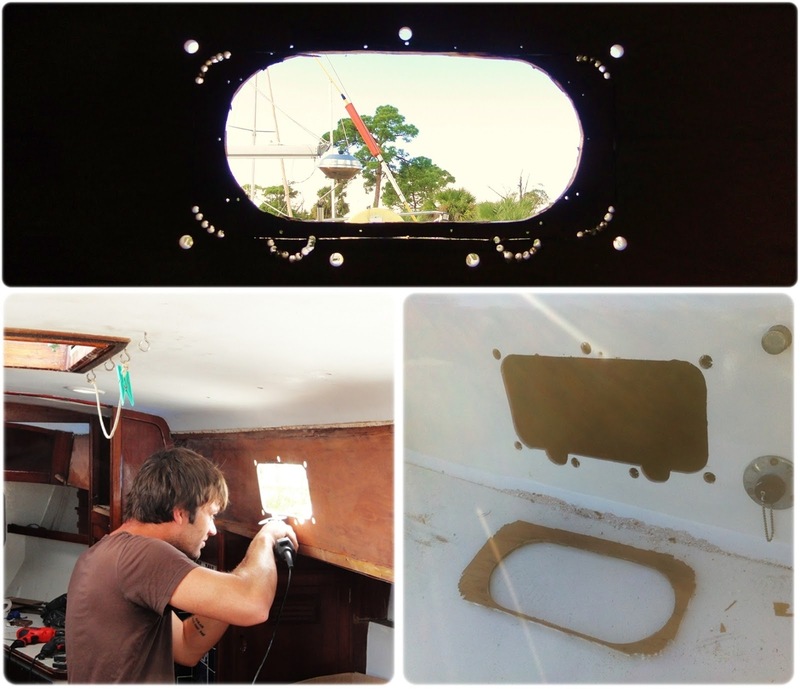 Beautiful watertight opening portholes, with insert-able bug screens! And if they ever leak just turn the screws a little tighter to squeeze the butyl rubber a bit more, or pull off the trim ring and cram more in. Their gold shine will soon be a dull brown patina. They're already speckling and darkening on the outside. While AJ worked on the engine installation I finished the exterior wood treatment. The cockpit seats were a sad sight. We debated whether to varnish them again, or to use the teak oil sealer we are using on the toe rails and hand rails. The Teak Sealer won. Varnish was just a fat list of cons in the comparison. The first inconvenience is it's requisite sanding between coats. One coat can take two to three days to dry, dragging out the process for days and days. Did I mention you have to sand before applying a new coat? Another drawback is that I have to wear a respirator around it. I thought it wouldn't be too bad in the open air, but I learned my lesson with a splitting headache, sore throat, dizziness and nausea. Always wear the stinking mask. In the future I'd rather not have to steer clear of the boat while varnish dries. 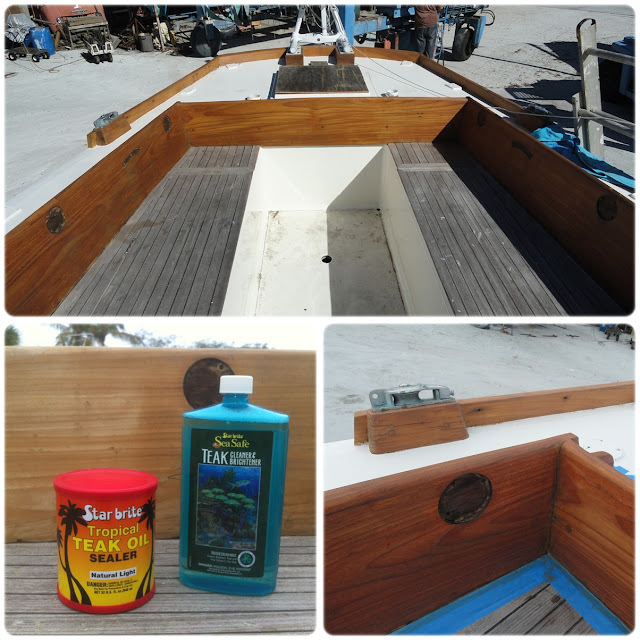 The teak oil sealer rectifies varnishes cons. No sanding between coats, it dries in a couple hours, and there are no irritating fumes. Though to use it the varnish had to be stripped completely, leaving no residue. I started with a heat gun and a scraper, then sanded until the bright yellow teak emerged. For first time application, wash freshly sanded teak with a teak cleaner/brightner/restorer. Hose it down with water, rub in the cleaner, let it sit a few minutes, or brush it in if the teak is really dirty, then hose it off until suds free. 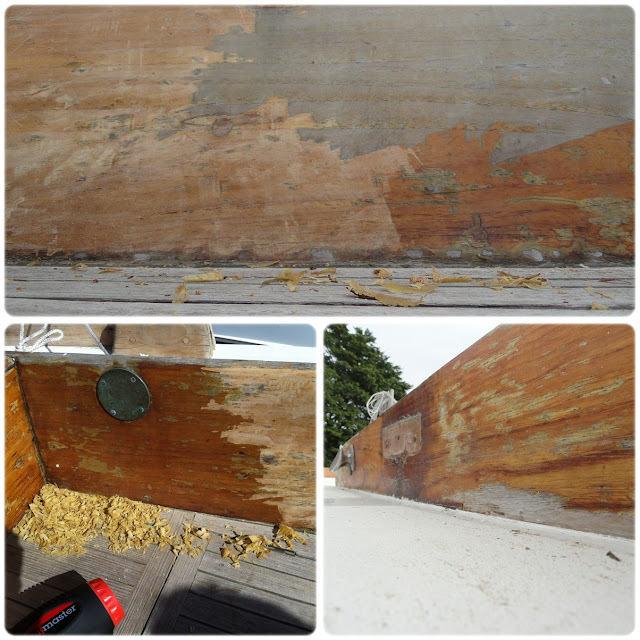 It is pretty incredible stuff, it takes out the dark spots and even restores soft black rotted areas back to a hard glowing yellow teak. When it dries apply the teak oil sealer with a foam brush. It looks like oily peanut butter in the can, but spreads on thin and soaks into the wood; It doesn't run and doesn't leave brush stroke streaks the way varnish can so you don't have to be a careful painter. Thick buildup spots can be wiped away with mineral spirits later. In fact we wiped all our teak with mineral spirits afterwards to even out the application and bring out the grain. It cures in UV, so on a sunny day it's dry in a couple hours. If it's in the shade, or totally overcast it can stay a little sticky for a couple days. Shown below are the toerails with a fresh coat of Starbright Teak Oil Sealer, and the cockpit seats are nearly fully stripped of varnish. I applied 3 coats of the teak oil sealer. It was dry enough by the time I got from one end of the cockpit to the other to apply the subsequent coats. It leaves a soft wood grain finish. It turned out the same reddish color as the varnished hatches, the difference is matte vs shiny. When it starts to wear or gray just apply another coat. No sanding necessary. The whole boat can be re-oiled and dry in a few hours. No muss no fuss, even if it has to be done a little more frequently than varnishing. We'll see how it holds up in a few months. I also applied the teak sealer to the handrails and the new toe rails. 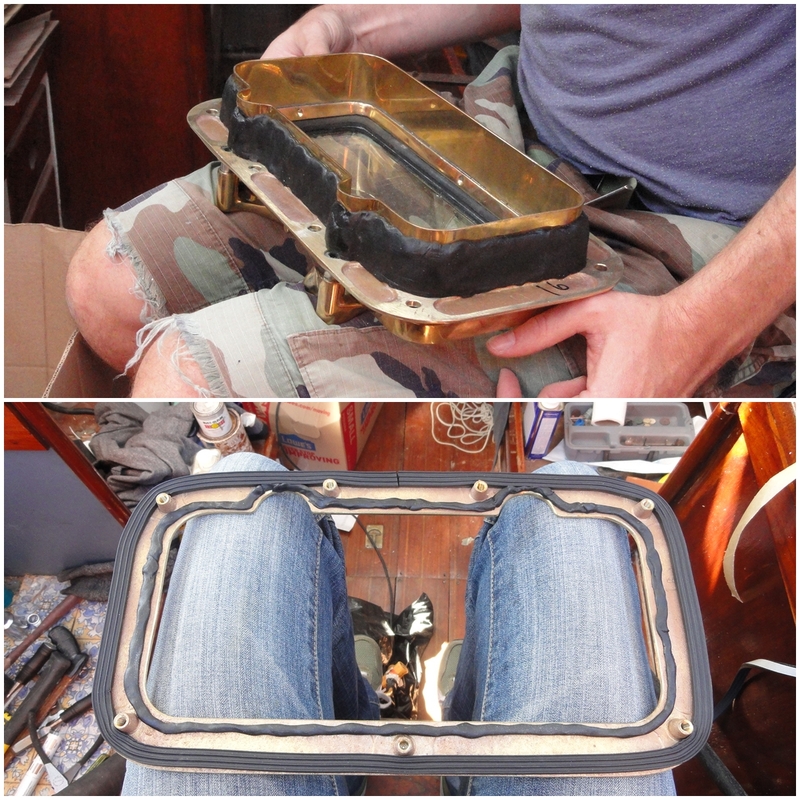 Oiling the toe rails before they go on the boat saved me about $40 in masking tape. That stuff is getting expensive! There's one more thing I love about this product; notice the Starbright Tropical Teak Oil can. It has a plastic lid on both ends! It won't leave a rust ring where it is stored. Genius Starbright! Mess free from storage to application. What a thoughtful detail. You guys have done a phenomenal job! I've got a quite similar project in progress/ahead of me. 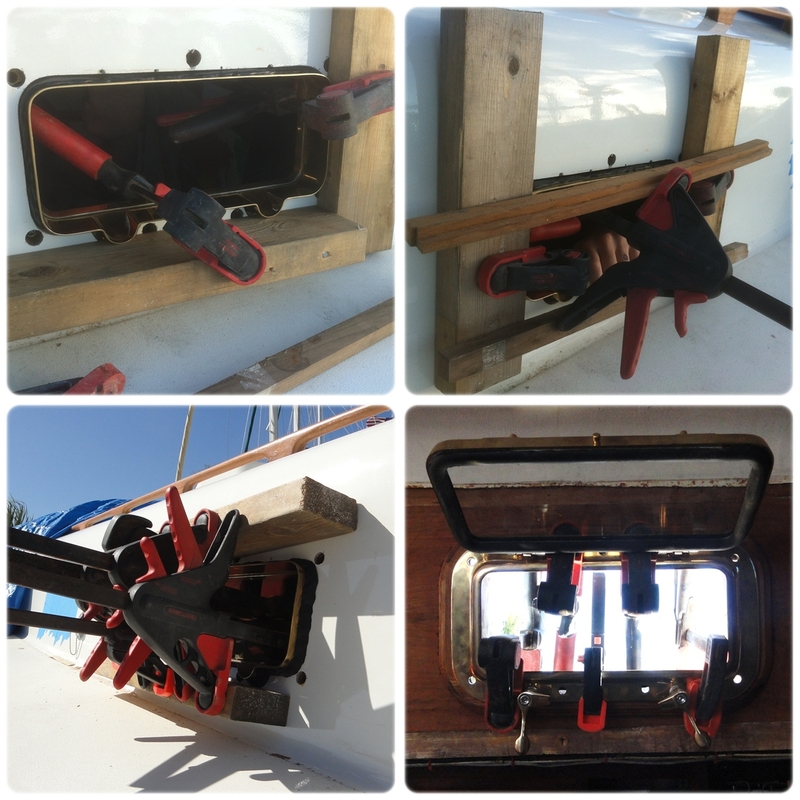 Just finished recoating the keel on my Cheoy Lee Clipper 42. I hope to basically do exactly what you've done. I'd love to pick your brain sometime about some specifics. Good luck!